I thought I'd take some of my favorite photos and turn them into memes. As near as I can tell, the requirements for a good meme are a square cropped picture, Impact font, and no limitation to facts or common sense. So I'm going to throw a bunch out and maybe they'll spread through the interwebs and bring a little light in the gloom of night. Or at least a chuckle from those who understand. 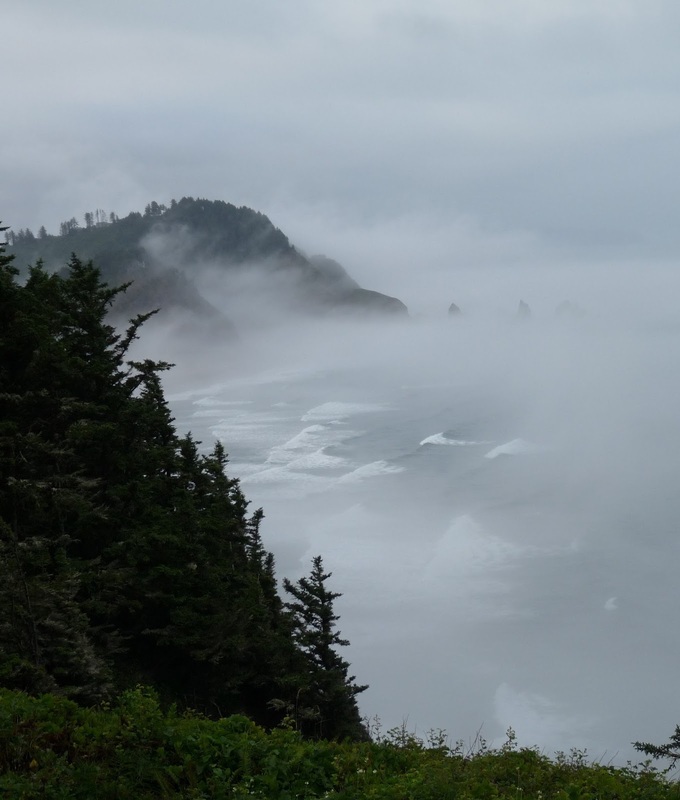 If you have any photos you'll like to contribute, just send them in. Or if you have a better caption for my pictures just let me know. Let's have a little fun with life even if we're stuck here on dry land. 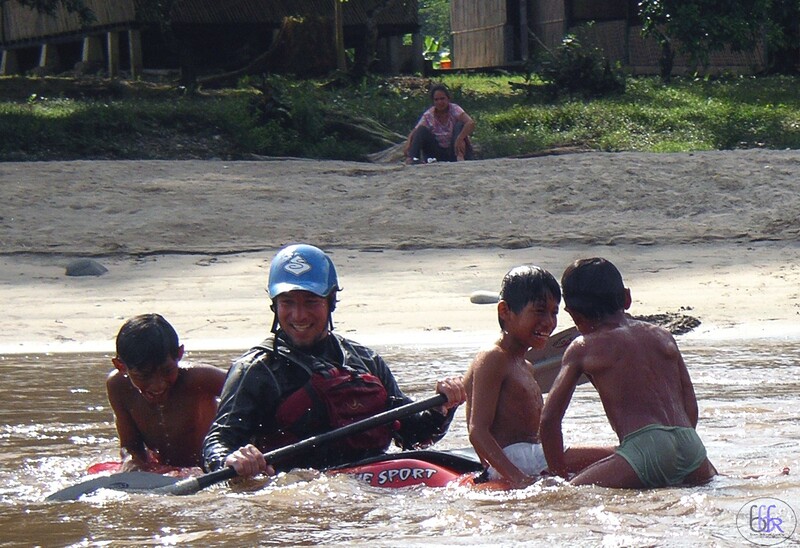 A Paddler's Journey for the Holidays! 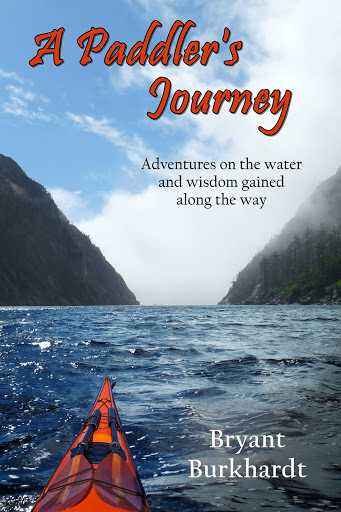 My kayaking memoir, A Paddler's Journey, has been out for a few months now and I can't tell you how great it is to hear from folks who have read and enjoyed it. When I showed up at Lumpy one of the participants searched me out to tell that her friend had read the book all the way through in one sitting and told her she had to get it. She wasn't reading quite as fast but was half-way through and loving it. A number of paddlers have expressed a little surprise that someone with my experience goes through the same issues: doubt, fear, frustration, failure. But that's kind of the point - the details may be different, the trips a little grander and rivers a littler harder, but we all really experience the same things. I think non-paddlers will get just as much out of it for the very same reasons. 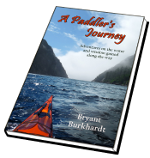 So in light of the holidays, and hoping people might want to share with their non-paddling friends a little window in the world of kayaking, I'm putting the book on sale. If you purchase it through the CreateSpace site and use the code XUW6M6ZV you'll get $3.00 off the cover price. That makes it only $9.99! In this day and age it seems impossible to have something interesting happen in the kayak world without it showing up on Facebook, getting discussed in forums, or even video appearing on the local news. And the news people aren't the only ones to sensationalize things - even your everyday paddler likes to talk about how crazy and extreme everything is. Then the internet outrage machine wants to pile on with their opinion - normally that someone did something wrong. Everyone has an opinion, it's easy to cast judgment, and the other guy is always in the wrong. 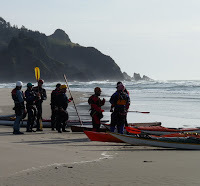 Debriefing incidents when things go wrong is one of the most valuable ways to learn and improve as a kayaker. But the essence of the process, the part that makes it worth it, is the time spent listening to those who were there and understanding exactly what happened and the steps along the way that lead to the final outcome. Looking at a single picture and claiming to have all the answers is a ridiculous way to go about it and does the opposite - it clouds the reality and teaches nothing. 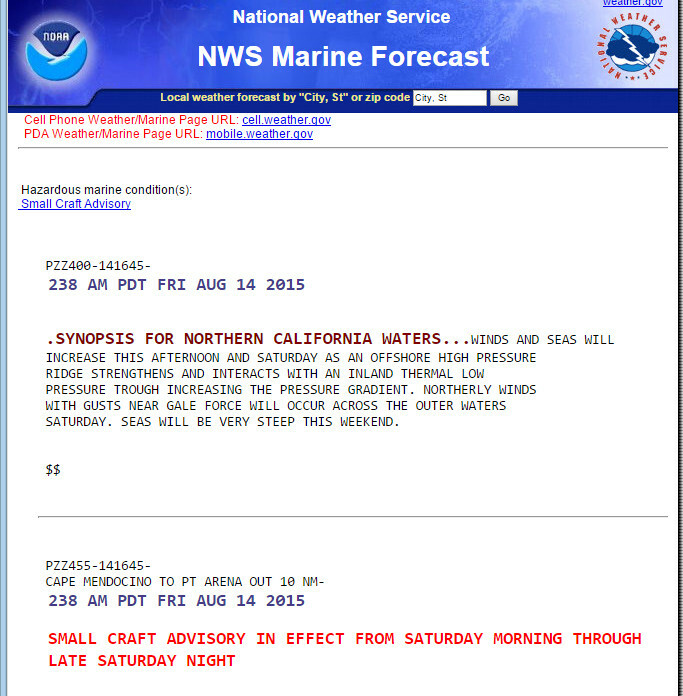 Here in California we recently had dramatic headlines: 54 Kayakers Rescued from Tomales Bay! 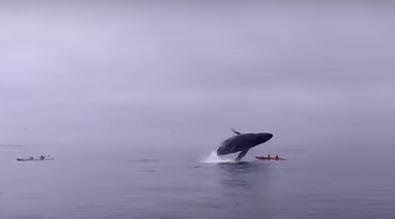 Breaching Humpback Whale Lands on Kayakers! Big enough headlines to grab the public's attention. And kayakers (of all levels) rush in to comment, both defending kayakers in general and attacking those who created such a visible spectacle. Neither does much good. I wasn't involved in either incident. But I do know there are lots of ways they could have gone down. 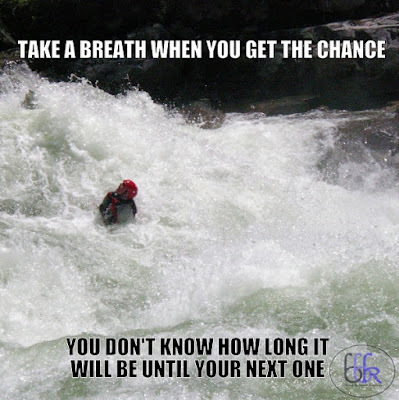 My experience as a kayaker and instructor tells me this. I've known incredibly competent and skillful kayakers to end up in really bad situations through very small errors in judgment. I've seen wildlife create havoc through no fault of the people involved. Every situation is complicated and has several sides and viewpoints, and the truth is a vague concept in the best of circumstances. But I've seen folks calling the kayakers in both incidents morons, rookies, fools, criminals, and worse. I've heard lots of folks saying kayakers shouldn't be out there - regardless of the fact that hundreds and thousands of kayakers have done the same trips with no problem, regardless of the fact that at the time of both incidents other kayakers were around and even came to the rescue. There have been lots of opinions from folks with very few facts. What I haven't seen or heard much is careful analysis, history and background, or a detailed recounting from those involved. Yes, it is illegal to approach within 100 yds of marine life. But the marine life apparently doesn't know that rule and they very often approach kayakers. Whales move much faster than we do, they often move long distances while underwater and out of site, and yet for all the many decades of kayakers watching whales in many places throughout the world this is the first time I've heard of contact - and it was only a glancing blow. Scary, but so far a one-of-a-kind situation. And taking large groups out at night can be challenging, but once again it's something that's been done time and time again without a problem. 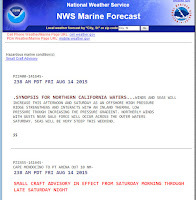 Conditions can change rapidly and forecasts are often wrong. Those 54 kayakers who were 'rescued' were simply given boat rides from the island where they safely landed back to shore. Maybe mistakes in judgment were made, but I sure don't have enough information to say that. I really don't like the easy judgment and criticism that flies so freely about the internet. 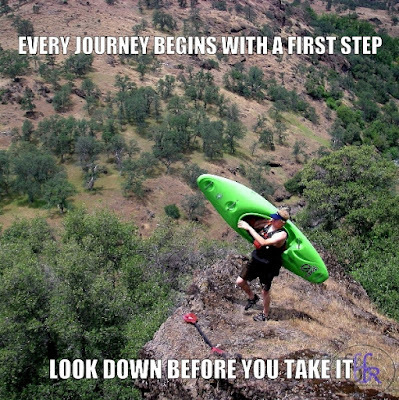 I hate to see it being applied to the world of kayaking - especially from kayakers themselves. Let's all think a little before we respond. Consider the possibilities and maybe even give the other person the benefit of the doubt. We could all probably learn a thing or two from these incidents, but we have to try a little harder. 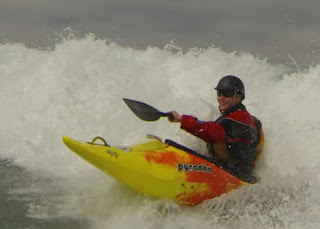 I was kayak surfing at Big River the other day, and on my paddle out I saw a big one coming and decided to turn and take it in. My takeoff was late but I managed to find the shoulder and start my run. That's when it hit me. One of the features of that location is the near vertical cliff wall on one side of the river mouth. 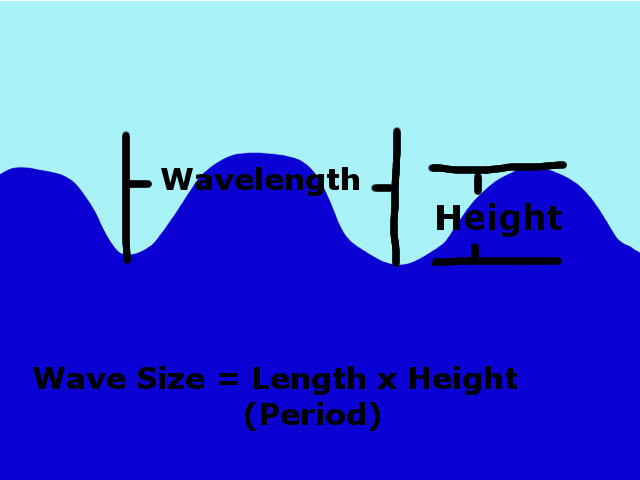 It often creates reflected waves that come at ninety degrees to the wave you're riding. The reflection comes down the line like a pulse of energy, and just as my ride started to crumble the pulse hit me and launched me into the air. I landed vertical, nose down, and drove deep into the building foam pile. 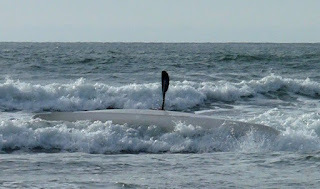 I tried to balance myself and even put my paddle out for support with the hope I could pop back up. My boat (a Necky Jive) is too long to loop even if I actually knew how to loop. But I thought if I could hold position my buoyancy would shoot me up and out and I'd at least be on the surface. That's when the rest of the wave collapsed. The freight train flipped me over and drove me deep under. Now I was upside down with a pile of water on top and nothing but twisting, violent currents surrounding me. This is the spot where many ocean kayakers will wait for the wave to pass and then roll up. Here's why that's a bad thing. While you're waiting, other waves are coming. The longer you wait to roll up the closer the next wave will be to hitting you. 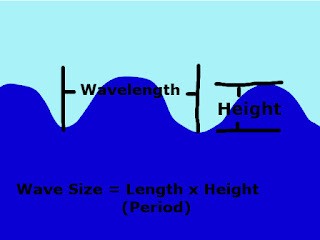 To fully take advantage of the lull between waves you need to be upright and paddling. It's great to be comfortable upside down, to think clearly and maintain your composure and awareness. But physically you can't accomplish anything. 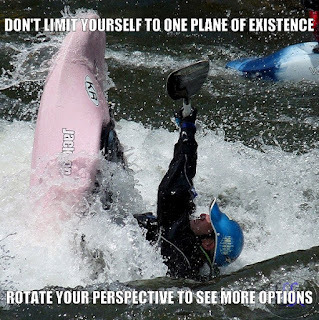 You're there to kayak and you do that upright. Take a lesson from river kayakers. On the river, waves don't pass. They stick around. Holes can be even worse. It's possible you'll flush out and have a calm pool to roll up in, but you can't count on it. Being upside down is dangerous for the fact you might not go anywhere and for the fact you might go somewhere you don't want. It's essential if you're paddling hard whitewater that you roll up right away and get on with your paddling. It's a normal progressioin in rolling on the river to wait. You get flipped in class II and there's probably a relatively calm patch of water after every feature. There aren't sticky holes. But as you move into class III, and definitely class IV, the rapids get longer, there are more features, and you can't always hang on until the flat part to roll. So you learn to roll in the mess. The first key point is simply the mentality. There's no thought of waiting. If you're upside down you start rolling up. Ideally you don't even worry about a set-up position. From wherever you find yourself, tucked or leaning back, however your paddle is oriented, whichever side it's on, you simply roll from there. If you can use the momentum of the water to help you all the better. That's the goal and it takes practice - the second key point. Everyone starts out rolling in flat water so it's natural to get used to that. And it's good to practice in the pool. But get your approach away from setting up and finding the right position. Stop looking for the surface. Change your understanding of rolling from a specific sequence of motions to a general concept of using your paddle and your body to bring the boat underneath you. Practice it from every position. Practice it in the current. Throw yourself in a hole or the foam pile and practice it there. There's a reason why playboaters have the best rolls - they flip themselves over in dynamic water on purpose all the time. 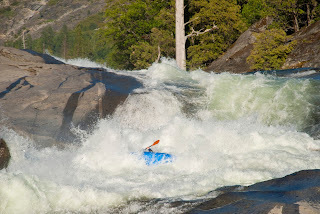 This is what you do if you want to paddle difficult whitewater. It's also what you need if you want to paddle rough water in the ocean. 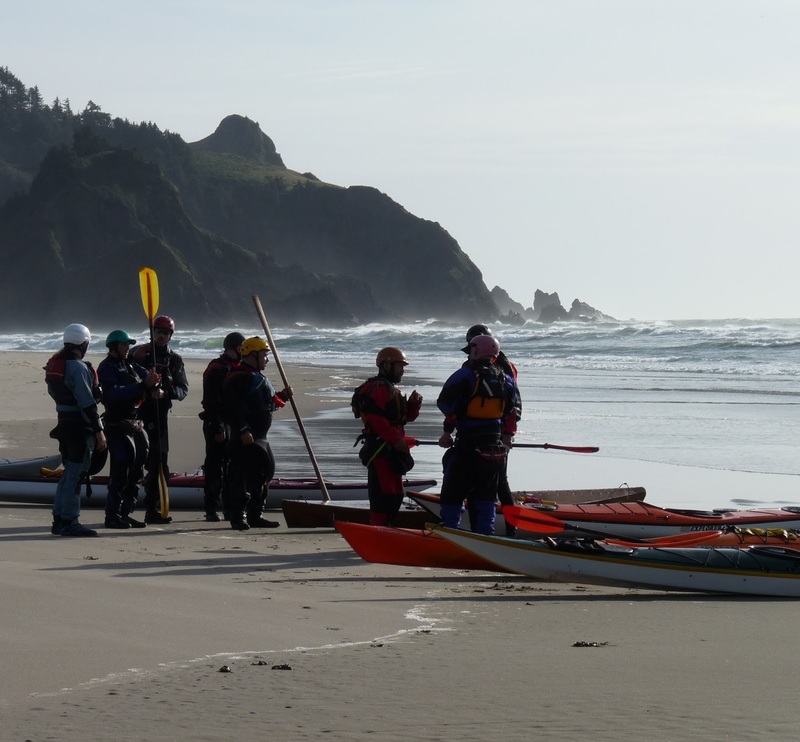 Too many sea kayakers seem content with the wait and roll approach. Their rolls depend upon specific techniques, often ones that bring them up lying on the back deck in unstable positions. That's fine to start, but don't stop there and let it become the habit. 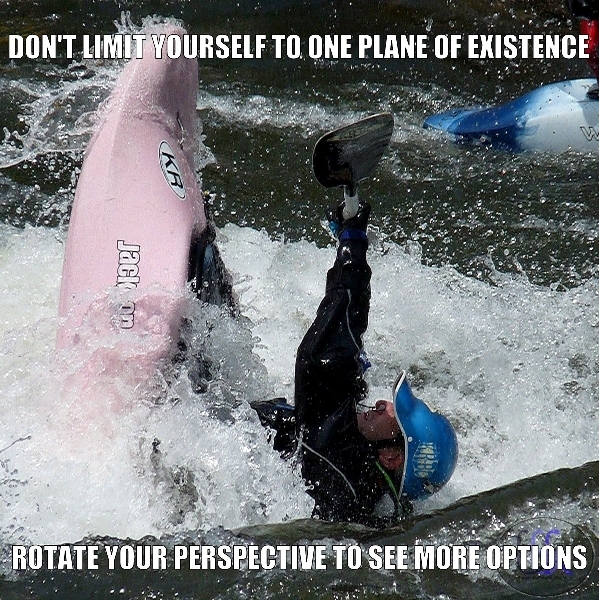 Learn some different rolls, work on both sides, and get really comfortable being upside down. Make your goal right away to be able to roll in the chaos and come up ready for more. It may take time and practice to get there, but you'll be a better paddler and a lot safer on the open ocean. I don't know how I rolled up from my wipeout at Big River. It was all very confusing, but I felt water pull on a paddle blade and I anchored myself on that blade and used my hips to bring my boat underneath me. I felt the air and I was up - facing backwards and still in the middle of the foam pile. One stroke in the smooth water behind the pile and I was free. I saw the next, larger wave coming and paddled to the side to avoid the hit. After making my way outside, I picked my waves a little more carefully and caught better rides without needing to roll again. That's how it should be.